In the case of Marlton resident and Troop 14 Scout Cameron Vinson, “proper planning and development” might be described by some as an understatement, as Cameron’s proper planning and development recently lead to him achieving the rank of Eagle Scout at just 13 years of age. Cameron, who was able to achieve that which takes many Scouts a majority of their Scouting career to accomplish, achieved the rank of Eagle with his project of renovating and enhancing the LeRoy Homer Memorial in Evesham’s Memorial Park. The memorial honors Evesham resident LeRoy Homer, who was the first officer of the hijacked Flight 93 in the Sept. 11, 2001, terrorist attacks. 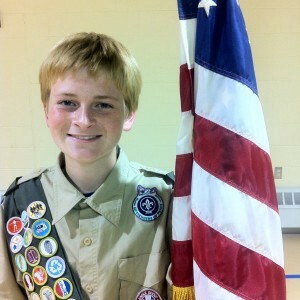 Now 14 years old and a freshman at Cherokee High School, Cameron said his drive to become an Eagle Scout dates back years, starting when he was just a Tiger in Cub Scouts. “It’s really just something I started when I was a Tiger Scout and I saw all these other Eagle Scouts and how people looked up to them and I wanted to be that person,” Cameron said. Cameron’s father, Fred, who was also Cameron’s cub master during his Cub Scout days, confirms that for his son, inspiration has always lead to motivation. That same motivation also applied to Cameron’s service project itself. In the fall of last year, Cameron cleaned up the memorial and removed anything that could pose a danger to the community. Then in the spring, he returned to the park to re-mulch the area and install a new bench, a sitting wall, stepping stones and more. Cameron said he originally got the idea for renovating the memorial from always passing by it and wondering what it was. Once Cameron learned the memorial honored LeRoy Homer, whose daughter Cameron actually shared a class with in third grade, he knew helping restore the memorial was what he wanted to do. “It was a project that meant a lot to me personally,” Cameron said. Cameron said the hardest part of the project wasn’t any one thing he had to do to the memorial, but instead it was simply finding other friends, troop mates and people close to him who were willing to help him as he undertook such a labor intensive project. In total, Cameron said he got 35 people to help at some point. He also said he wanted to thank Lee Dawson, supervisor of parks in Evesham, and the individuals and organizations that helped with the funds and supplies for his project, including the Township of Evesham, Home Depot, Lowes, Mimlitch Enterprises and Evesham Lawn Service. As for his future plans now that he has already become an Eagle Scout, Cameron is also serving as senior patrol leader for Troop 14 and has been a den chief for Pack 14 for the last several years. Cameron said he hopes to continue to help lead by example, especially for his younger brothers also in Boy and Cub Scouts, who also want to become Eagle Scouts themselves someday. “It’s definitely unique because being an Eagle Scout has taught me so many things about leadership that I can carry on through the rest of my Scouting career, and not just into the real world,” Cameron said.